Dental365 was founded on the concept of providing convenient and affordable dental care for the entire family. We offer modern dentistry services from expertly trained specialists and general dentistry practitioners. 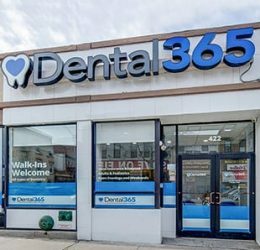 Dental365 has multiple locations throughout New York City. Whether you are seeking a general cleaning and exam, cosmetic treatment such as porcelain veneers, or a restorative procedure like a dental bridge, our caring doctors can help you achieve a beautiful, healthy smile. Get more information about our Brooklyn dental practices by clicking on the individual location buttons below.